Recently Claudette, on the 'I Love Cross Stitch' Yahoo group, asked, (as have others in the past), just how I could have stitched such a complex piece as Creation without first charting it. Here is the story. One morning last February, I listened to a friend read the first few lines of the Book of Genesis in the Bible. Since I am a very visual person, when I hear something or read something on a page, most of the time a picture of that description pops into my mind. I really see it in my mind's eye. When she read the words "And the Spirit of God was hovering over the water", that word hovering struck me, visually. I could see a glimmering mist hanging over a dark body of water, slowly undulating, shimmering in the absence of any other light. And then, for some reason, I thought, "I should stitch that!" The reason that is odd is that I am a sampler person, not a stitched picture person. I knew I wanted a dark, earthy color for the background. I had a full yard of Zweigart dirty linen, which is an unbleached, natural linen in a light coffee shade. I tend to like this color anyway. I had no idea of the size this piece would be but did know it needed to contain certain elements. The words of the text, a stormy sky, a representation of the eye of God, the Creator. The Spirit hovering over the water, and then Light. So, as one does when designing a poster or other illustration that includes words, I loosely sketched and sketched and sketched. Finally, being the somewhat impatient soul that I am, I hefted the yard of linen onto my lap, snapped on a hoop (this was before my wonderful stitching stand was even a gleam in my eye) and stitched "In" with the "I" from a very large and ornate antique alphabet. I continued stitching the first few words until I realized if I kept going, this sampler would be 750 stitches wide - a bit much by anyone's standards. So.... I took a break and went to bed. It was late on that first day of stitching. Very late and dark on that cold February here in north Idaho. And I dreamed and saw the clouds. The clouds swirled and boiled in my dreams; the stormy blues, grey greens and rich cobalts, pale greens, teals, deep sea blue-greens rolled into golds and finally becoming ecru and white. They are sort of Van Gogh-ish in inspiration, but mostly mine. Think "Starry Night". Next morning, I opened my boxes of flosses and pulled out all my favorite blues, greens, golds and I had no choice but to simply begin. I proceeded from the edge of the third line of text, which as it happens reaches about halfway across the pattern. I stitched the churning clouds, planning that they would involve all those colors, representing the stormiest of storms to the glowing and peaceful finale that would include the eye of God, sending the fingers of light earthward. Those clouds took weeks. Meantime, while alternately dreaming and stitching what I dreamed, I worked on a row of motifs and more text. I included some specialty stitches and finally got down to that hovering bit. At that point, I decided where the right side should end, and was able to trim the excess fabric. Thank goodness for that, because summer was nigh and wrangling a yard of hot linen in one's lap with a 12" hoop is not a fun thing to do. I stitched the borders on each side and the next dilemma was just how far to continue downward? Should I stitch more of Genesis or less? Consideration for the size of the final piece won out and I decided that simply ending with "And there was light" was sufficient. So there it was. I knew where the end would be, just not how it would appear in thread. More dreams, more weeks, slight burn out. Let's be honest - major burn out. Finally, finally, I "saw" the sun. Yes, there it was, reaching with glowing fingers, heavenward. One might think the sun would be in the heavens, but in this case, the heavens were a lot further up than the sun - into eternity, I would say. So, now to stitch the sun - how many golds, yellows, ecrus, whites? Since I had no thought of ever charting, the idea that maybe a zillion colors might be a deterrent to another stitcher did not occur; I went wild. Well, not a zillion, but a lot. I perused my many photos of sunsets. Here in the mountains we have wonderful sunsets that gild both the winding river and the hilltops. Sunsets here are rife with brilliant and unbelievable colors. I began with the ball of fire, and then rays reaching upward, outward - long, fiery, golden strands of color, twisting, twining, touching everything in creation, such as there was at that point. I tried several times to chart the sun, but it was no use. Not that I couldn't chart it. I couldn't stitch from the chart which was too complex, and I too anxious to see it on the fabric. Nothing worked as well as simply gathering all the colors, many needles threaded and at the ready, and simply going about it as my mind's eye dictated. Feverishly. At some point, I paused and looked at that flaming sun. I realized even the sun's rays can extend only so far and look balanced on the stitched piece. The entire right side at the bottom was open. Again, I dreamed and then, searching my files of antique and copyright free motifs, found a lovely old curling design that was reminiscent of ocean waves, or whatever one chooses to imagine. I alternated most all of the other blues, teals and golds as I worked from light, near the sun, to dark toward the furthest edge. 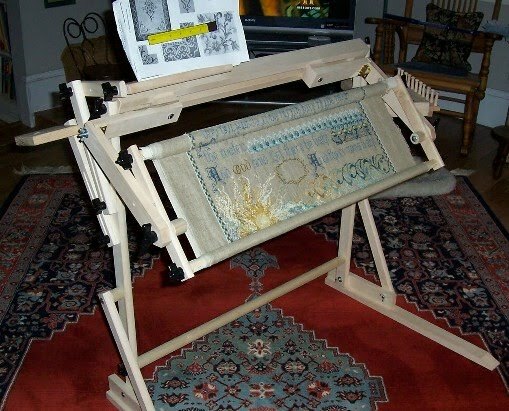 By then, I had the work mounted on my stitching stand. What a relief to see more than a small circle. Also, the hoop left marks and crushed those pretty stitches, so the scroll frame was a wonderful help. By then, another winter had arrived. I added a central motif, slightly modified to fit. I entered initials and a date, an old one for fun, and sat back, satisfied. So there is the story, from February 17th, 2009 thru November 1, 2009. Creating Creation took a lot of time, but in the end, I think it was worthwhile. This is a first for me. I never thought my words would be in any sort of print, electronic or ink. Here we go, thanks to that needle flying beneath my fingertips. That, and of course my fingers that fly across the key board, turning ideas in my mind into a reality others can see.